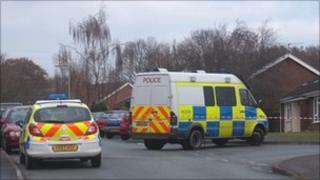 A man in his 50s has been arrested on suspicion of murder after a body was found at an address in Shropshire. Officers were called to the address in Caradoc View, Hanwood, a village near Shrewsbury, at about 1840 GMT on Tuesday, where they found the body of a woman aged in her 50s. At 0500 GMT officers arrested a man in Shrewsbury over the death. Police have appealed for anyone who saw any suspicious activity in the area on Tuesday to contact them. The scene has been cordoned off for forensic investigations. A pathologist is due to carry out a post-mortem examination within the next few days to establish a cause of death. Formal identification of the victim has not yet been carried out, West Mercia Police said.